While domestic online sales in the United States and the European Union will continue to increase — taking sales away from brick-and-mortar stores — growth rates will flatten out over the next 10 years. The most explosive growth will be in worldwide cross-border ecommerce, with the Asia Pacific region leading the way. Research firm Forrester foresees cross-border ecommerce outpacing domestic growth, with a compound annual growth rate of 17 percent between 2017 and 2022, compared with 12 percent for overall B2C ecommerce. Key reasons people shop outside their local areas are to obtain products that are not available locally and to pay less for goods. 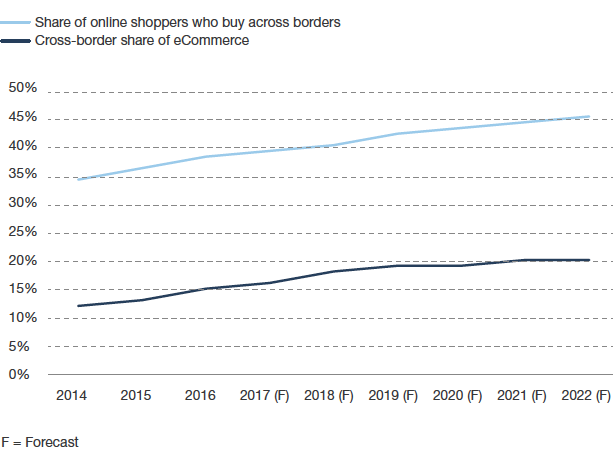 Two-thirds of cross-border online shopping is done through marketplaces. Enhanced localization, better logistics, and more payment options are making it easier for consumers all over the world to buy goods from other countries. The ease of ordering from mobile devices opens up online sales to a new customer category in countries where most people do not own a computer. The increasing penetration of smartphones has opened up both the Middle East and Africa as small but growing markets for foreign products. Forrester predicts that cross-border purchases will comprise 20 percent of all worldwide ecommerce in 2022, with sales of $627 billion. The Asia Pacific region, dominated by China, will become the largest ecommerce cross-border region for both imports and exports. Rising incomes, an expanding middle class, and dissatisfaction with domestic products propel China’s ecommerce growth. China has 300 million middle-class consumers clamoring for foreign goods. Globally, clothes, footwear, and toys are the most popular retail categories bought cross-border. Hotel reservations and airline tickets are the most popular non-durable goods purchased. Forrester predicts cross-border ecommerce sales, as a percentage of total ecommerce sales, will increase through 2022, to roughly 20 percent. The percentage of online worldwide shoppers who buy across borders will increase, too, to roughly 45 percent. Source: Forrester Research, Inc., 2017. Online Cross-Border Retail Forecast, 2017 To 2022 (Global). Half of global worldwide cross-border ecommerce expenditures will come from Chinese consumers in 2017, according to Forrester. Consulting firm Accenture predicts that more than 200 million Chinese will be cross-border shopping by 2020, with a transaction volume of imported goods purchased online reaching $245 billion. Alibaba, the China-based ecommerce giant, is actively seeking foreign goods for its Tmall website from both multinational consumer-package-goods companies and small businesses. Its logistics platform provides an integrated services package for small businesses that might not otherwise be able to sell in China. To beef up its Chinese sales, Amazon introduced its Prime program in that country, offering members free cross-border shipping. Globally, cross-border sales account for nearly one-quarter of third-party units sold on Amazon. Not surprisingly, a majority of cross-border shopping is done via marketplaces that offer one-stop seamless services for payment, delivery, regulatory compliance management, and import duties. Chinese payment platforms Alipay, operated by Alibaba affiliate Ant Financial, and WeChat Pay, owned by Chinese service provider Tencent, formed a partnership with Stripe, a firm that facilitates both merchants and individuals the ability to make online payments. Stripe operates in 25 countries. Through the partnership, anyone who uses Stripe will be able to accept payment via both Alipay and WeChat Pay. In the Middle East and North Africa region, half of all ecommerce purchasing is cross-border, according to KPMG, the accounting and consulting firm. In March 2017, Amazon purchased Dubai-based Souq — called the Amazon of the Middle East — that sells over 8 million products online annually, mainly to Gulf countries and Egypt. Cross-border returns are extremely costly for sellers, affecting 8 percent of overall online sales, according to the Federal Express 2016 Annual Report. The high cost is one of the main reasons many merchants don’t make international sales. Through its affiliate program for ecommerce sellers, PayPal offers a free “Refunded Returns Service” that covers the cost of returning unwanted goods to overseas sellers. Buyers who want to return their item can get a refund for the shipping cost, up to a certain value. PayPal also offers a buyer-protection program, reimbursing consumers for items that do not arrive or don’t match the product description. This helps give otherwise hesitant cross-border buyers confidence that they will not be out-of-pocket for the cost of the item. According to the “CrossBorder Merchant Research 2016” report from market research firm Ipsos, 36 percent of U.S. online merchants are selling across border. Fifty-three percent of cross-border sellers use online marketplaces — with eBay and Amazon being the most common. 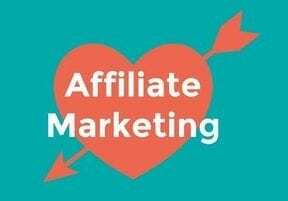 Fifty-eight percent of American cross-border sellers currently offer one currency for all markets (the U.S. dollar), but most acknowledge that this is not the best option. Learn about local preferences and cater to them by tailoring offerings to consumer demands — from luxury goods to baby formula, depending on the country. Adhere to local customs and tax regulations. Local customs are especially important in the Middle East and pertain to what to sell and how to deliver the goods. In the Middle East and Africa, cash on delivery is the most common payment form. Offer premium delivery options for those who can afford it. Standard shipping can be slow and unreliable in the Middle East, Africa, and parts of Asia. Use a marketplace that offers cross-border services if you are a small seller. This will make for a smoother purchase process for customers and lessen the chance that you will run afoul of customs regulations.